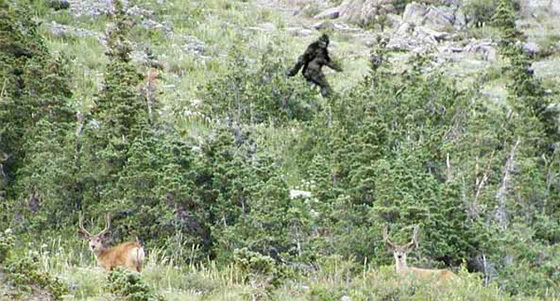 Finding a native ad attached to a landing page is like spotting Bigfoot. Image source. Many marketers seem to be confused when it comes to native advertising. This became clear to me recently while moderating a panel on native advertising featuring digital marketing, advertising and PR professionals, a conversation that mirrored what I later read in a native ad study conducted by Hexagram and Spada. 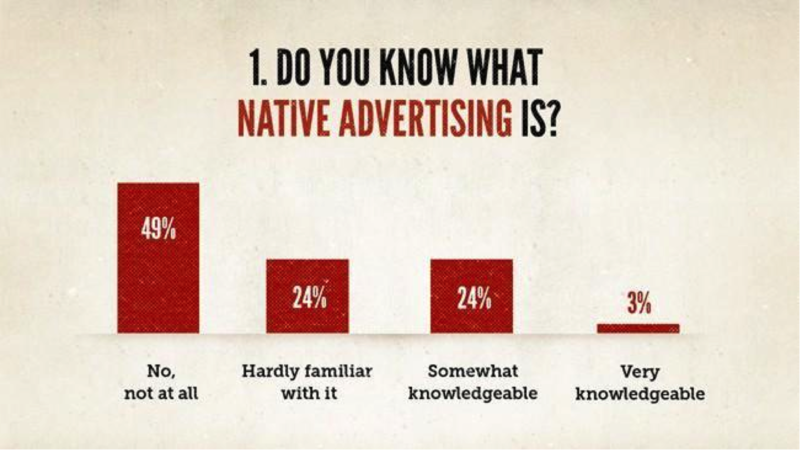 The study revealed that 53% of respondents considered native advertising to be “sponsored content,” while 38% thought native ads were better defined as “company branded pages” (I’d argue that both answers are true). In Copybloggers’ State of Native Advertising Report, 73% of respondents self-identified as being hardly familiar or not familiar at all with native advertising. If this was just a problem of definition, it wouldn’t be such a big deal. But it seems that marketers are still struggling with how to tie native advertising campaigns to tangible marketing goals. As I was researching this post, I found it remarkably difficult to spot a native advertisement attached to a proper landing page. If you’re going to invest in content that’s good enough for people to click through on their favorite blog or Facebook feed, why wouldn’t you jump at the opportunity to carry the conversation forward? Native ads without landing pages aren’t much different than banner ads. Sure, they build brand awareness but they barely stand a chance of converting. Landing pages are the key to wringing measurable results out of your native advertising campaigns. But before we get any deeper into the value of attaching landing pages to your native ads, let’s start by addressing the industry’s definition problem once and for all. 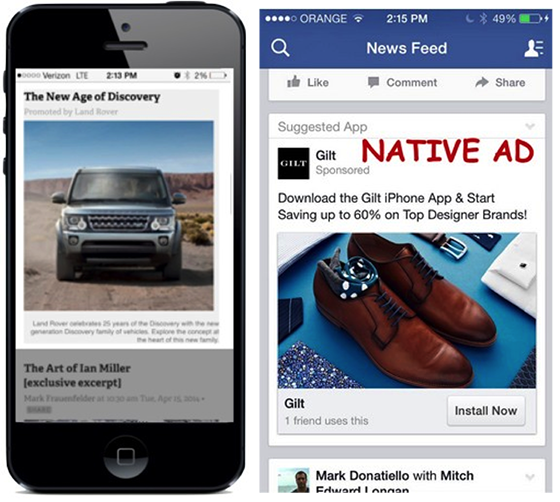 Perhaps marketers are confused because there are so many types of native ads. SAP sponsored the creation of this native content. 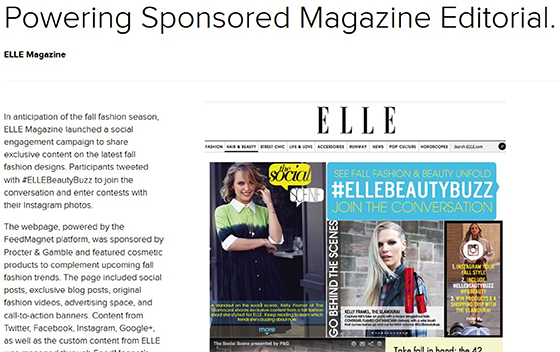 ELLE Magazine released native editorial content that was sponsored by Proctor & Gamble. Native video ads, such as this ad by Doritos, generally have shareable, “viral” content. A native Mobile Ad next to a social native ad. I like this definition because it pinpoints what separates native ads from their traditional counterparts and is broad enough to include the diverse and emerging forms of native advertising. Best of all, it explains why landing pages are the key to successful native ad campaigns. And because you will have clean conversion data, you’ll be able to optimize your page and marketing funnel through A/B testing. In other words, tracking the success of your native ad by attaching it to a landing page will not only help you drive conversions and ROI but also provide insight for your next ad campaign – native or otherwise. Many consumers and journalists have accused native advertising of blurring the lines between editorial and advertorial content on the web. Landing pages make it clear where the content ends and the call to action begins. Native ads exist within the context of an established blog, website or social media platform. That’s what makes them “native.” But it also means that they are surrounded with distracting links, images and other juicy content. If a lead is engaged enough to click on a native ad, a well-optimized landing page will make their next step very clear. 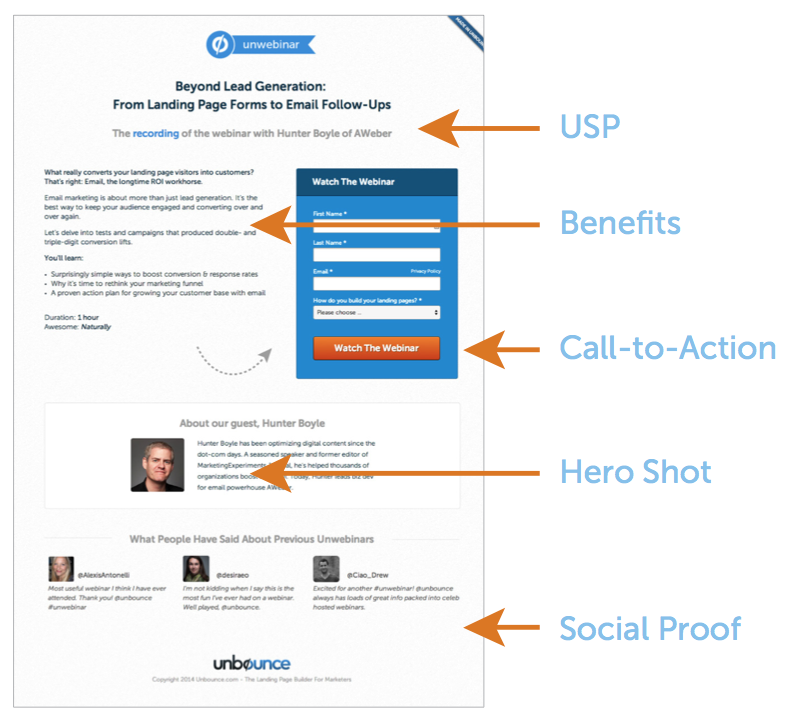 The five elements of a high-converting landing page in action. Native ads don’t always come cheap so if you’re going to invest in them, take the time to design your landing pages properly. You’ll see your hard work pay off in terms of captured leads and conversions. What’s that you say? You can’t seem to find a good example of a brand actually doing this? As I mentioned earlier, finding a native advertising campaign attached to a perfect landing page is like spotting Bigfoot. In my search I did come across some brands who came close. Let’s look at some examples of native ads that lead to landing pages – and see where they nailed it and where they missed the mark. This is a rare example of the exotic branded playlist in its native Grooveshark habitat. 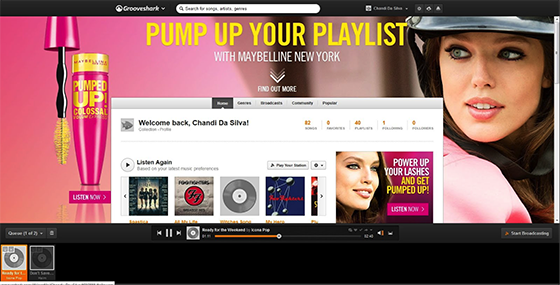 This Maybelline-sponsored playlist can be considered a native ad because it mirrors the experience of the music streaming platform. Once the user clicks the “Listen Now” button, they are taken to a third-party site belonging to the advertiser. 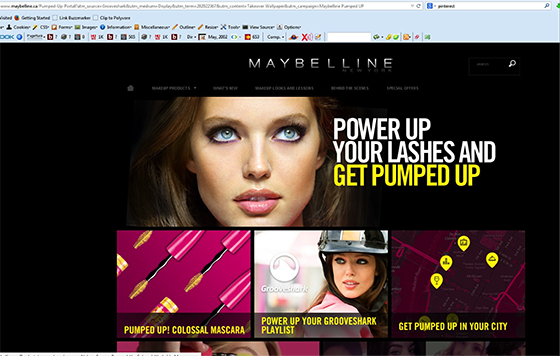 The microsite offers many actions for the lead to take, including watching videos, making a playlist, sharing “pumped up” moments on social media, participating in a live event or purchasing mascara. While they did a great job of keeping the branding and design consistent from ad to landing page (design match, anyone? ), they could have improved their conversions with a dedicated landing page – with one intended action and only one CTA. 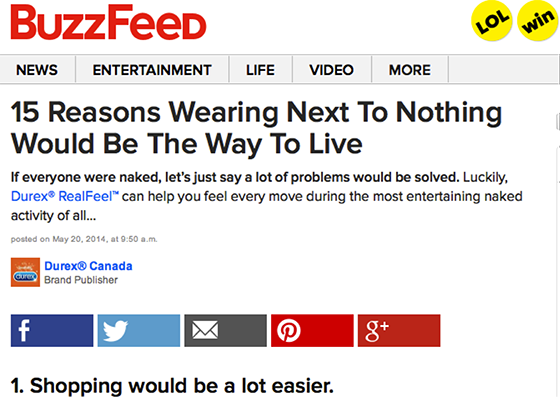 This is a sponsored post by Durex Canada that’s native to BuzzFeed. Durex has done a good job at creating a branded page with a clear CTA. 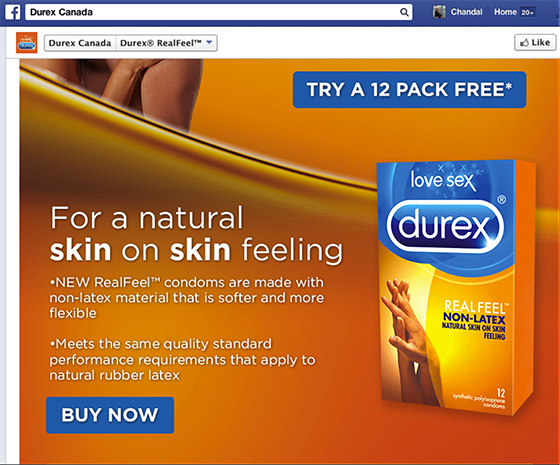 And while embedding the page on Facebook is an interesting tactic that gives people the opportunity to check out Durex Canada’s Facebook page, there may be too many actions that distract from their “Buy Now” goal. It would be wise to test this Facebook-native page against a standalone landing page. Shiner Beer created a native ad video on the Onion and connected it to a social campaign. Shriner linked to a page on Facebook like Durex, but here the the intended action is social media interaction. Still, the intent of their campaign is muffled by the possibilities of liking their page (or even clicking through to one’s own feed – away from the brand message entirely). If you want maximum effectiveness out of your native ads, a dedicated landing page with one action only is probably the way to go. But don’t take my word for it. Always test test test. Finally! A native ad campaign attached to a dedicated landing page. Personally, I don’t like the layout of the page, the amount of text or the number of form fields, but there are a few things that CDI has done well. First, they have one clear call to action without any menu or additional navigation to distract you. They could emphasize the intended goal even further by removing the phone number in the upper right-hand corner. 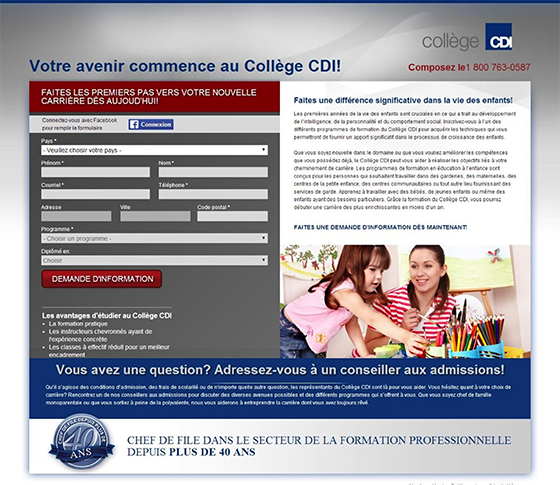 Next, CDI has attempted to reduce the friction of their super-long form by offering to auto-fill the form for you using Facebook, knowing that it was this social network that drove you to their landing page in the first place. 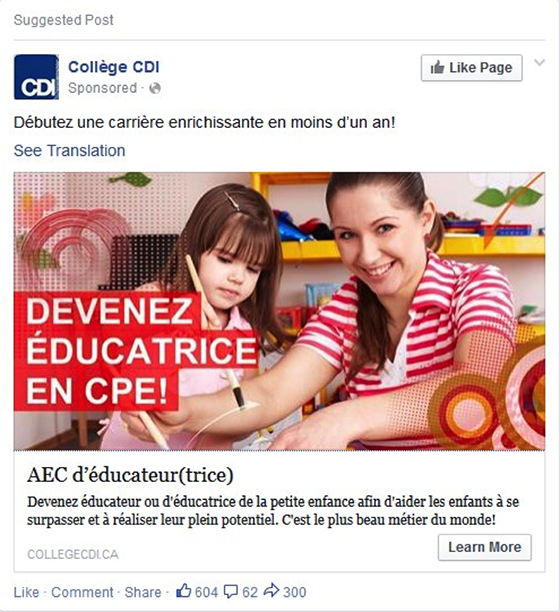 Thank you CDI for this rare sighting! In a world where display ads are often blocked, skipped and ignored, native ads offer marketers a chance to connect content and conversion in a compelling way. The problem is that the native ad space is largely unchartered territory and there are no universal definitions or best practices. This means that publishers aren’t quite sure what a native ad is worth to advertisers, and marketers aren’t sure how to measure their campaigns or how much of their budgets they should be allotting to them. Landing pages allow marketers (and publishers) to track the success of their campaigns and further engage with the audience-consumer. There’s no excuse not to use them. Chandal Nolasco da Silva works at AOD Marketing, with a focus on client strategy. She has consulted and collaborated on a variety of digital marketing strategies, developed websites and written content for a number of brands. Chandal has worked for Canada’s federal government, completed various teaching contracts, is a published author and writes a web column in her spare time.